Stephane Grappelli was an Italian jazz violinist (some say French) born (in Paris) on January 26, 1908. Grappelli started his musical career playing the violin on the streets of Paris. He began playing violin at age 12 (1920), and attended the Paris Conservatory from 1924 to 1928. He continued to play on the side until he gained fame in Paris. He also worked as a pianist for silent films while at the conservatory and played the saxophone and accordion as well. His reputation as a jazz violinist was first established after he (and Django Reinhardt) formed the Hot Club Quintet of France in 1934. He is best remembered for hundreds of jazz recordings he made with dozens of famous musicians, playing both, violin and piano, though mostly violin. YouTube has videos of him. Here is one he did with Eddie South. It is the Bach Double concerto in jazz style. 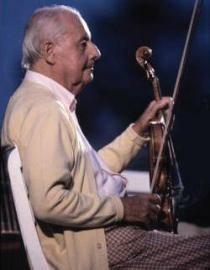 Grappelli died on December 1, 1997, at age 89.